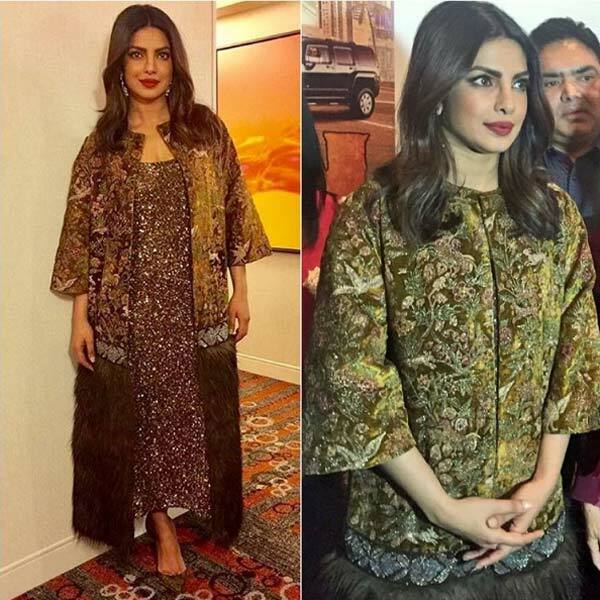 Priyanka Chopra’s fashion outings this weekend has made us happy and sad at the same time. Check out why. Something is definitely wrong with Priyanka Chopra. Did you fire your awesome stylist? Or are you going way too bold with your fashion? What I can tell for sure is that she is impressing and leaving me cringing at the same time! It’s an art, I gotta tell you that. Okay, before you wonder what I’m saying, let it put it straight out there. The actress ventured out this weekend and wore two things that caught our eyes in mirth and well as put our heads down in shame. It’s really surprising how she managed to make me happy and sad at the same time with her fashion outings. Clearly, in the name of experimenting, the actress went a little, just a little far! However, she sure knows how to clean up the act! You can see her looks from this weekend and see how she took a nice spin at ethnic fashion. Clearly, Sabyasachi’s fur designs are definitely not the right kinds for our desi divas. While the designs themselves aren’t very flattering, by wearing it, the actresses are just looking bad. 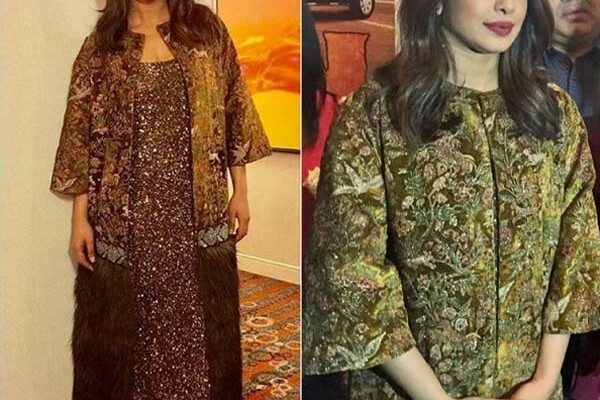 As you can see here, wearing a kitchy Sabyasachi ethnic jacket on top of a shimmery number, PeeCee is looking quite drab. In a way, I do blame the stylist for bringing together two heavy numbers together. While sometimes heavy elements on fabric do work well together, this is not one of those instances. Atleast she has kept the makeup minimal. Otherwise this would be a terrible heavy look and you’d instantly skip it. Perhaps without the jacket, the look would’ve been appealing. For the launch of her upcoming Punjabi film, Sarvann, she once again chose a rather sober Sabyasachi creation. Of course, here she looked oh-so-divine as she promoted the film in Canada. The beautifully embellished outfit is a clear winner and you can’t deny that. Even the shade suited the actress so well that I was mesmerised. Perhaps PeeCee, these are the kind of stuff you should explore more on instead of experimenting with already explored fabrics. Doesn’t she look divine?